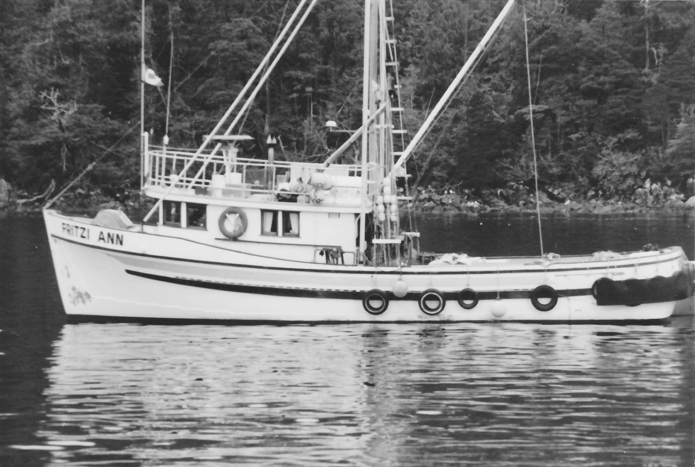 The picture above is the Fritzi Ann as she was built in 1969 by Harold Remmem. Nice looking boat. Seaworthy looking boat. With some study we can see her relationship to the smaller (42′) sisters discussed in my earlier post on Remmem Boatworks. At approximately 52′10″ overall the Fritzi Ann is (as far as I know) the largest boat to come out of the North Surrey shop. In 1990 Fritzi Ann received a new aluminum deckhouse which was taller but purported to be lighter, she also had a large stern deck extension added so she could carry 500 Prawn traps on deck. According to Transport Canada a roll test at launch (1969) showed a GM of 19-20″ (0.5m)(No word on the load condition). A roll period test performed after the 1990 modifications indicated a GM of approximately 11″(0.33m). In July of 2002 Fritzi Ann capsized in a tide rip off Kelsey Bay while running south with almost full fuel and water tanks and 500 prawn traps on deck. It was daylight and calm and the 3 man crew got off okay. The boat was re-righted 2 days later in Kelsey Bay. Then TSB (Transportation Safety Board) ran another roll period test and found that when she capsized her GM was 9″(0.23m)…….Current minimum initial GM for fishing vessels is 14″ or 0.35m. I think that without exception every vessel I have done stability analysis of has been claimed by the owner to be “very stable” and in some cases “exceptionally stable”. Yet some of these vessels did not meet the TC minimum stability requirements. Clearly operators can use more education in the area of stability, but this is understandable as it’s a complex subject. Fish Safe BC is doing excellent work in this area. Picture by Don Macmillan at Louscoone Inlet on Herring 1979.